It seems that our french friends over at BlogEEE.net have gotten their hands on a prototype of the Asus EEE Keyboard all-in-one keyboard computer. After plugging it in and messing around it a little bit, they decided to take it apart. Although BlogEEE.net is in French, we were able to learn several things about this prototype. 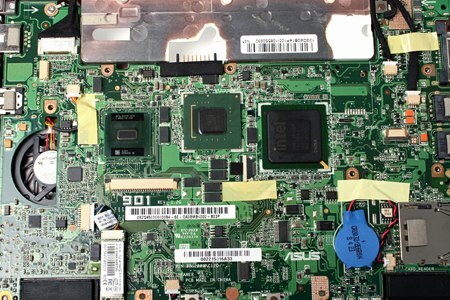 According to the site, the PCB in their EEE keyboard is marked as Revision 1, meaning that it is very possible that this could be the finalized version of the PCB that will be seen in retail units. Also, they mention the presence of a Silicon Image sil1392cnu, a chip responsible for sending HD graphics via the EEE’s onboard HDMI port, supporting resolutions anywhere from 480i to 1080p. Perhaps one of the most impressing details uncovered was that when weighed the EEE keyboard clocked in at an impressive 2.1 pounds, lighter than most keyboards that don’t have an onboard CPU or display. While we’ve learned a lot about the Asus EEE Keyboard so far, there is still no information available regarding its release date. Some of the Eee Box PCs have been shipped with viruses on board and ready to go. The virus was sitting on the D: drive, labeled as recycled.exe. As soon as that drive is opened, the virus is unleashed on the other drives and removable media attached. Strangely, Microsoft has come to the rescue as their Malicious Software Removal Tool detects it and removes it. This was only on some models, and apparently mostly in Japan. Before you denounce ASUS for this oversight keep in mind that they make things that we really want, such as the touch screen Eee PC promised in 2009. Jkkmobile has just posted their touchscreen hack for an Eee PC 900, and it looks great. Installation of this kit is pretty easy, just fit the panel to the screen, connect the controller to the USB lines, close it up, calibrate it, and you’re done. The controller board is placed on top of the WiFi card. Jkkmobile has informed us of touchscreens for older Eee PCs before, but this is one of the first we’ve seen for a 900+ model. The post lists a few sources for touchscreen kits, but no word on which one they used.